Barack Obama is portrayed as a manipulative, opportunistic politician by Ryan Lizza in a 15 page article in this week’s The New Yorker magazine. “Making It, How Chicago Shaped Obama”, gives an in depth run down of Obama’s well planned political path. The major point being is he’s no messiah, just a typical politician. The illustration shows the couple pumping fists in the Oval Office of the White House with the US flag burning in the fireplace. 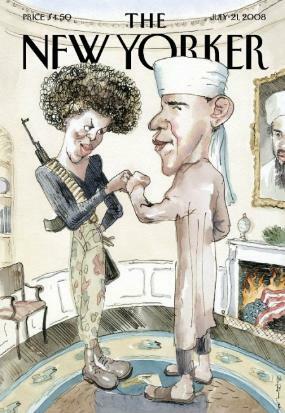 Mrs Obama has an Afro hairdo and an automatic rifle strapped across her back. A portrait of Osama bin Laden sits above the fireplace. The latest polls show Obama and McCain statistically even. This is a sharp drop for Obama who’s numbers are falling as he continues to attempt to pivot to the center. A tough place to be when you are the most liberal member of the U.S. Senate. Rasmussen Reports: “For the second straight day, the Rasmussen Reports daily Presidential Tracking Poll shows that the race for the White House is tied. Sunday’s numbers show Barack Obama and John McCain each attracting 43% of the vote. When “leaners” are included, the two candidates are tied at 46%. The voters are noticing Obama’s flip-floping on every issue that won him the race for the Democratic nomination. His slogan “Change”is definitely him, but is it change you can really believe in?